Look at that image on the DVD cover, great isn't it? Well now erase that image from your mind because this film is nothing like that, sure it has a shark, hot(ish) women and water but after that nothing. The estimated budget of this film was $350,000, where this was spent is another matter. 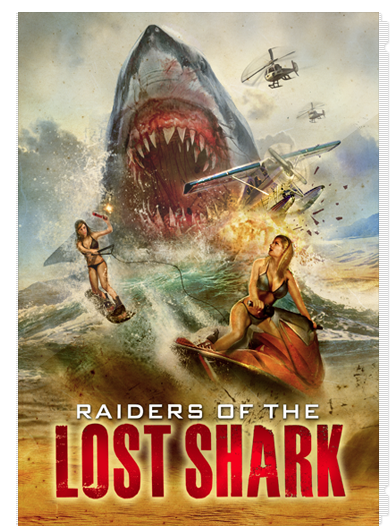 The plot is a simple one, a top secret military lab has decided for better or worse to develop a shark and weaponise it for use in warfare. Naturally this just doesn't go to plan for the military as the shark makes its way to the local beaches and chomps on the residents of this quiet lake side community. Here to save the day is local teacher Prof.Carly Reynolds (Candice Lidstone) who has taken on these sharks before as it is revealed her sister was killed by one in the past. Deciding she has had enough she joins forces with those who created this monstrosity to seek and destroy it once and for all. Considered a 'so bad its good' movie is maybe pushing it a little but it is a fun film and it knows what it is. Obvious JAWS quote "get out of the water" gets a mention. Surprisingly short which isn't a bad thing as otherwise this film could have out stayed its welcome with its humour. Look out for the seafaring captain who talks like a pirate and the best mobile phone in the world!